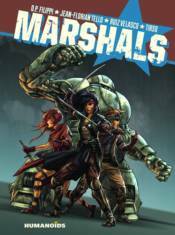 Within the complex political consortiums and clans of planet Iriu, the Marshals are in charge of security and defense, assisted by huge robots. Young Hisaya is one of the top Marshals, despite her unpredictable nature, but her destiny takes an unexpected turn when she's wrongly accused of murdering a high-ranking scientist, and is forced to go on the run. Teaming up with her expert mechanic grandfather, and her ambitious younger cousin, Hisaya attempts to clear her - and the entire caste's - name and unravel the conspiracy that threatens the planet. D.P. Filippi (Muse, John Lord), Jean-Florian Tello, Tirso (Whispers in the Walls), and conceptual artist Francisco Ruiz Velasco (Hellboy II, Pacific Rim) seamlessly blend samurai swordplay, police procedurals, and steampunk, in this fast-paced manga-style sci-fi adventure.